NEW YORK - The demise of Toys R Us will have a ripple effect on everything from toy makers to consumers to landlords. 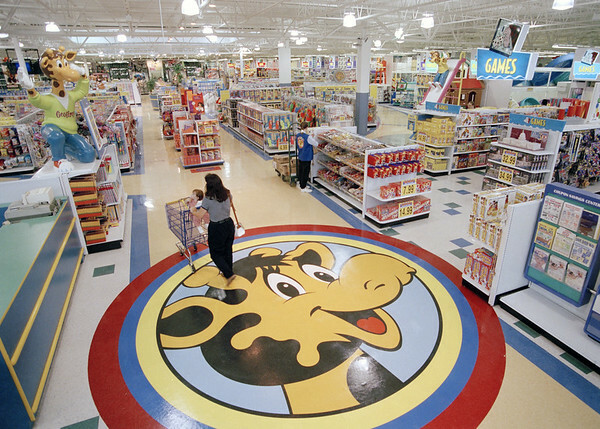 The 70-year-old retailer is headed toward shuttering its U.S. operations, jeopardizing the jobs of some 30,000 employees while spelling the end for a chain known to generations of children and parents for its sprawling stores and Geoffrey the giraffe mascot. The closing of the company's 740 U.S. stores over the coming months will finalize the downfall of the chain that succumbed to heavy debt and relentless trends that undercut its business, from online shopping to mobile games. And it will force toy makers and landlords who depended on the chain to scramble for alternatives. CEO David Brandon told employees Wednesday the company's plan is to liquidate all of its U.S. stores, according to an audio recording of the meeting obtained by The Associated Press. Brandon said Toys R Us will try to bundle its Canadian business, with about 200 stores, and find a buyer. The company's U.S. online store would still be running for the next couple of weeks in case there's a buyer for it. It's likely to also liquidate its businesses in Australia, France, Poland, Portugal and Spain, according to the recording. It's already shuttering its business in the United Kingdom. That would leave it with stores in Canada, central Europe and Asia, where it could find buyers for those assets. Toys R Us Asia Ltd. has more than 400 retail outlets in Brunei, China, Hong Kong, Japan, Macau, Malaysia, Philippines, Singapore, Taiwan and Thailand. It is a Hong Kong-based joint venture with the Fung Group, which owns a 15 percent stake. It also controls Asian sourcing giant Li & Fung, a major supplier to Western retailers like Wal-Mart. A Fung spokesperson did not immediately reply to a request for comment. When Toys R Us initially announced it was filling for bankruptcy protection last year, the Asian venture said it was not affected and operated as a separate legal entity independent of other Toys R Us businesses around the world. In Hong Kong, where Toys R Us has 15 stores, parents said there were few other choices in a retail market dominated by a few big players. “If you want something like a mainstream toy shop, then Toys R Us is the only place you can go,” said Ching-yng Choi, whose home and office are both within walking distance of Toys R Us shops. “Basically either it's Toys R Us or you go to specialized and very expensive toy shops that sell, for example, wooden toys that come from very far away countries like in Europe,” she said. Toys R Us had about 60,000 full-time and part-time employees worldwide last year. Brandon said on the recording that the company would be filing liquidation papers and there would be a bankruptcy court hearing Thursday. “We worked as hard and as long as we could to turn over every rock,” Brandon told employees. When the chain filed for Chapter 11 bankruptcy protection last fall, saddled with $5 billion in debt that hurt its attempts to compete as shoppers moved to Amazon and huge chains like Walmart, it pledged to stay open. But Brandon told employees its sales performance during the holiday season was “devastating,” as nervous customers and vendors shied away. That made its lenders more skittish about investing in the company. In January, it announced plans to close about 180 stores over the next couple of months, leaving it with a little more than 700 stores. The company's troubles have affected toy makers Mattel and Hasbro, which are big suppliers to the chain. But the likely liquidation will have a bigger impact on smaller toy makers that rely more on the chain for sales. Many have been trying to diversify in recent months as they fretted about the chain's survival. Toys R Us has been hurt by the shift to mobile devices taking up more play time. But steep sales declines over the holidays and thereafter were the deciding factor, said Jim Silver, who is editor-in-chief of toy review site TTPM.com. The company didn't do enough to emphasize that it was reorganizing but not going out of business, Silver said. That misperception led customers to its stores because they didn't think they would be able to return gifts. Now, the $11 billion in sales still happening at Toys R Us each year will disperse to other retailers like Amazon and discounters, analysts say. Other chains, seeing that Toys R Us was vulnerable, got more aggressive. J.C. Penney opened toy sections last fall in all 875 stores. Target and Walmart have been expanding their toy selections. Even Party City is building up its toy offerings. “Amazon may pick up the dollars, but won't deliver the experience needed for a toy retailer to survive and thrive in today's market,” said Marc Rosenberg, a toy marketing executive. But the company lost ground to discounters like Target and Walmart, and then to Amazon, as even nostalgic parents sought deals elsewhere. GlobalData Retail estimates that nearly 14 percent of toy sales were made online in 2016, more than double the level five years ago. Toys R Us still has hundreds of stores, and analysts estimate it still sells about 20 percent of the toys bought in the United States. It wasn't able to compete with a growing Amazon: The toy seller said in bankruptcy filings that Amazon's low prices were hard to match. And it said its Babies R Us chain lost customers to the online retailer's convenient subscription service, which let parents receive diapers and baby formula at their doorstep automatically. Toys R Us blamed its “old technology” for not offering its own subscriptions. But the company's biggest albatross was that it struggled with massive debt since private-equity firms Bain Capital, KKR & Co. and Vornado Realty Trust took it private in a $6.6 billion leveraged buyout in 2005. Weak sales prevented them from taking the company public again. With such debt levels, Toys R Us did not have the financial flexibility to invest in its business. The company closed its flagship store in Manhattan's Times Square, a huge tourist destination that featured its own Ferris wheel, about two years ago. In filing for bankruptcy protection last fall, Toys R Us pledged to make its stores more interactive. It added demonstrators for the holiday season to show people how toys work, and began opening Play Labs at 42 stores, areas where children can play with different items. AP Retail Writer Joseph Pisani contributed to this report in New York. AP Business Writer Kelvin Chan contributed from Hong Kong. Posted in Newington Town Crier, Business, Newington News, State on Thursday, 15 March 2018 11:07. Updated: Thursday, 15 March 2018 11:10.